Action from ICA Sports 0, AFC Stanground Sports 2. Photo: David Lowndes. It’s looking like a two-horse race for the Peterborough Premier Division title after Pinchbeck United’s win over Netherton United on Saturday (March 11). It was billed as a must-win game for the city side, but they suffered a second beating at Knight Street of 2017. Action from AFC Stanground Sports' win at ICA Sports. Photo: David Lowndes. It was closer this time with Pinchbeck winning 2-1 through a 10th-minute penalty from top scorer Ollie Maltby - his 50th goal of the season - and a goal 10 minutes from the end from Liam Ogden. Netherton had equalised through Adam Scott 60 seconds before Ogden’s winner. Pinchbeck remain second four points behind Peterborough Sports Reserves, three points clear of third-placed Moulton Harrox (with a game in hand) and nine points ahead of Netherton. Sports were missing several regulars - Peterborough Northern Star’s Jake Sansby was in their starting line-up - and laboured to a 2-0 home win over Sawtry with second-half goals from Ian Bradbury and Gerard Evans. Harrox pipped Langoft United 2-1 with goals from Ben Allen and a visiting defender. There was a shock defeat for ICA Sports in a city derby against AFC Stanground Sports at Ringwood. ICA had won their six previous matches heading into the game, while Stanground had lost their previous seven, but goals from Lea Ibbott and Louis Shepherd secured an unlikely 2-0 win. Luke Ball scored twice as Stamford Lions beat Deeping Rangers 3-1 and George Edwards did the same as Thorney won 4-0 at Stilton United. Ketton won 2-0 at Leverington, while there was a goalless draw between Wisbech Town Reserves and Crowland. The PFA Junior Cup Final will be contested by Peterborough League Division Three title rivals Bretton North End and FC Peterborough. 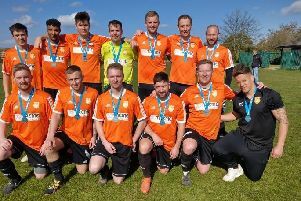 Bretton hammered Oundle Town Reserves 7-0 in their semi-final, but FC Peterborough needed penalties to see off Whaplode Drove after a 1-1 draw. ICA Sports 0, AFC Stanground Sports 2 (Ibbott, Shepherd). Pinchbeck United 2 (Maltby, Ogden), Netherton United 1 (Scott). Oundle Town Res 0, Bretton North End 7. (FC Peterborough won 4-3 on penalties).